We are so excited to announce a new partnership with Special Spirit Therapeutic Riding Center! This amazing organization will be a training location for our group of veterans to get experienced with horse basics, and begin learning refined skills to lead them into job placement in the equine industry. We are so inspired by their passion for what they do, and humbled by their enthusiasm for joining forces with E.E.T. and getting veterans sustainable and healthy employment. More updates to come as this develops! Marce Olson (a Masterson Method Practitioner) is showing Kaylee (a riding instructor at Special Spirit Therapeutic Riding Center) some therapeutic techniques for walking a horse who is holding pain and tension in his neck . *Kaylee's cute bunny ears were for Easter weekend. 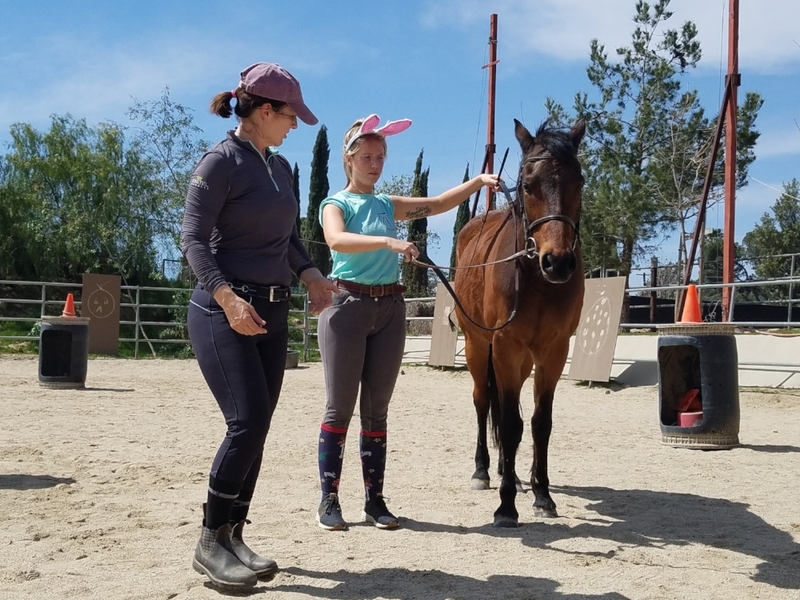 In other news, Darlene Dubacher (an employee of one of our other partners, Lifesaver Wild Horse Rescue) is going to be continuing her Masterson Method training under E.E.T. sponsorship. She recently completed her 5 Day Course (which is an impressive accomplishment), and will be going on to earn her certification for field work and coaching. The skills she is learning helps her daily in her work with abused and rescued horses. She can help heal their bodies and minds which allows them to be adopted to new thriving and loving owners. This is such important work, and we're excited to be able to be a part of her journey to learn these skills. Kristen (E.E.T. Operations Manager), Terry Erlwein (Darlene's Masterson Method training Coach), Darlene Dubacher, and Journey (a rescued Percheron) at the Lifesavers Adoption and Training Ranch in Lancaster, CA. There's a lot of great things in the works, so more updates to come!! Newer PostWild Horse Warrior Women's Veteran Retreat Success!